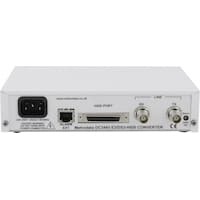 The DC3445 provides a new level of price/performance in connecting bridges and routers to E3 34.368Mbps or DS3 44.736Mbps leased lines. Higher speed router connectivity to the WAN becoming more common-something to do with the growth of the Internet. Some higher speed routers offer WAN interfaces at E3 and DS3, although these often have additional overhead due to their use of ATM technology. The DC3445 HSSI to E3 / DS3 converter was developed to offer a simple solution for Routers with a standard HSSI interface, to use a DC3445 to convert to (non-ATM) 34Mbps or 45 Mbps, and then be able to use the full bandwidth of the link (rather than having an ATM conversion overhead) and thereby save money, compared to the cost of the E3 ATM Cisco WAN Interfaces. The DC3445 spans the gap between the synchronous interface of a bridge or router and an E3 or DS3 leased line. The DC3445 offers a HSSI Interface and BNC connectors for the E3 or DS3 line interface. The DC3445 interface speeds and clocking modes are configured simply by setting the dip switches. The DC3445 can easily be rack mounted in either a 1U two unit rack mount kit, in a 6U eighteen unit rack mount kit. N.B. Care must be taken when using the DC3445 with services which are terminated in North America as the DC3445 requires clear channel DS3 circuits for correct operation. This application shows a DC3445 connecting a HSSI router card to an E3 34Mbps G.703 leased line, such as a BT Megastream-34 service. HSSI serial ports are often the most cost effective high speed WAN port available on routers. This application shows a pair of DC3445 units connecting a pair of HSSI routers via an E3 34Mbps G.703 leased line, such as a BT Megastream-34 service. HSSI serial ports are often the most cost effective high speed WAN port available on routers. This application shows a DC3445 connecting a HSSI router card to an unframed clear channel DS3 45Mbps G.703 leased line, such as a BT Megastream-45 service. HSSI serial ports are often the most cost effective high speed WAN port available on routers. This application shows a pair of DC3445 units connecting a pair of HSSI routers via an unframed clear channel DS3 45Mbps G.703 leased line, such as a BT Megastream-45 service. HSSI serial ports are often the most cost effective high speed WAN port available on routers.